Smeringopus pallidus, copyright G. McCormack. The Pholcidae, daddy-long-legs spiders, are a cosmopolitan family of spiders with usually very long legs, most of which build sheetwebs or cobwebs in secluded locations. Characters (from Huber 2011): Clypeus high; six or eight eyes present, arranged in two triads separate from anterior median eyes (if latter present); leg tibiae with three trichobothria; leg tarsi pseudosegmented, fourth tarsi with comb-hairs; male chelicerae usually modified; male pedipalp usually heavily modified, including proximal segments, with process of palpal tarsus (procursus) usually present; female external genitalia often sculptured, more or less sclerotised to produce an epigynum; egg-sac carried in chelicerae by female. [HD-S02] Haddad, C. R., & A. S. Dippenaar-Schoeman. 2002. The influence of mound structure on the diversity of spiders (Araneae) inhabiting the abandoned mounds of the snouted harvester termite Trinervitermes trinervoides. Journal of Arachnology 30 (2): 403–408. [H11] Huber, B. A. 2011. 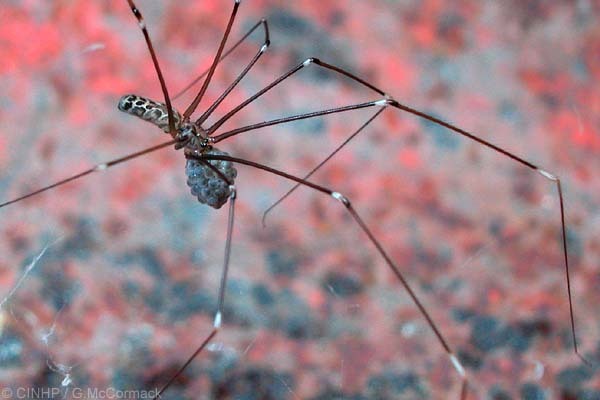 Phylogeny and classification of Pholcidae (Araneae): an update. Journal of Arachnology 39 (2): 211–222. [HF08] Huber, B. A., & N. Fleckenstein. 2008. Comb-hairs on the fourth tarsi in pholcid spiders. Journal of Arachnology 36 (2): 232–240.